While the city is still digging itself out of a massive snowstorm, it’s never too early to start planning for the upcoming Valentine’s Day. With the weather being like it is these days, it might be a good idea to limit your travel. For those who are looking to celebrate with a romantic dinner and a show, why not make it easy on yourselves and enjoy both in one venue? Here are 5 places in Toronto that offer a dinner and a show! Famous People Players Dinner Theatre – 343 Evans Ave. The Famous People Players have a storied history in Toronto, when it was founded as a small theatre troupe specializing in black light and glow-in-the dark puppetry in 1974. Their first act was an elaborate musical number featuring a puppet version of Liberace playing the piano. Since then, the troupe has toured internationally with several different acts and has even performed with the real Liberace on many occasions. 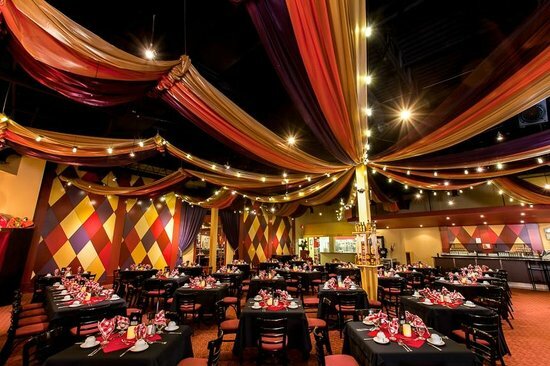 In 1994, the Famous People Players expanded with their Dine and Dream Theatre, which pairs a gourmet dinner with a full show. Diners are first treated to a three-course meal, after which they are invited to watch one of the Famous People Players’ black light acts. After the show, they are given a chance to mingle with the cast over tea, coffee and dessert. With good food coupled with a dazzling show, the theatre is an excellent venue for a Valentine’s Day dinner and even for family get-togethers! 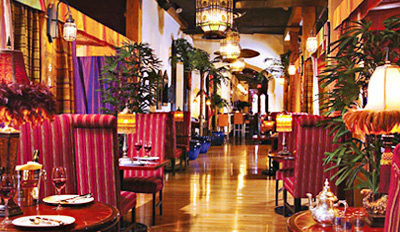 The Sultan’s Tent has long been famous in Toronto for its authentic French-Moroccan cuisine, its lavish decorations and of course, it’s well-known belly dancing performances. The interiors of The Sultan’s Tent are almost always adorned with colourful fabrics and furniture, making it seem like a setting from a Middle-Eastern folktale. Meals are best shared with large groups of people and include large sharing platters that are filled with juicy lamb chops, chicken breasts and Black Angus rib-eye. On an almost nightly basis, the Sultan’s Tent features professional dancers in flowing Middle-Eastern style dresses, moving rhythmically to upbeat, Arabian-style music. For those looking to feel full and entertained, this is definitely the place to go! The Sportsnet Grill recently took over the venue once held by Arriba, a restaurant nestled within the Marriot Hotel on Blue Jays Way. 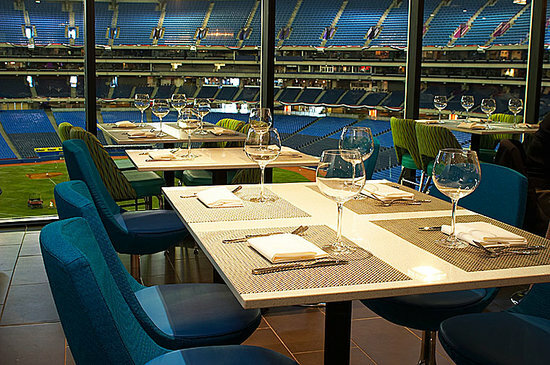 What’s special about the Sportsnet Grill is that it has a full view of the baseball diamond at the world-famous Roger’s Centre – a huge plus for sports lovers! Food at the restaurant features bar classics such as the Book It Burger, an 8 oz Angus burger served with tomato, arugala and smoked scallion mayo, and the Flying Fadoo, an 8 oz NY Striploin served with caramelized onions and frites. Baseball season won’t start for another few months, but there will definitely be a few team practices scheduled on the days leading up to Valentine’s Day. 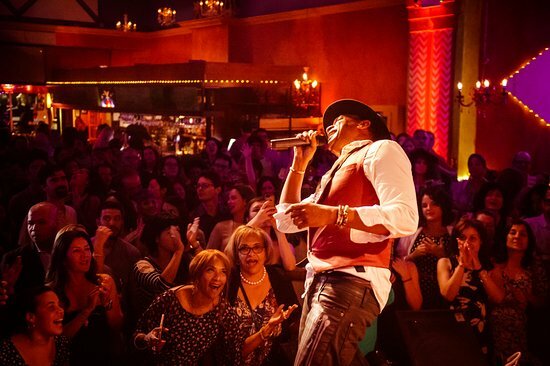 Something’s always happening at the Latin-themed Lula Lounge, whether it’s the bar’s band performances, its live singers or its regular salsa and tango sessions. Festive doesn’t even begin to describe the lounge’s interiors, which are filled with bright lights and electrifying colours over a large dining area and dance floor. The menu features plenty of Caribbean-style flavours, including the Pernil Mambo No. Five – a tender, braised pork shoulder served with red onion and anatto, and the Classic Jerk Chicken – boneless chicken cooked in the traditional Jamaican style. The Lula Lounge always has musical events scheduled, including a romantic dinner and tango night featured this Valentine’s Day. Be sure to check it out! Medieval Times – 10 Dufferin St.
For those who love reliving their childhoods, the Medieval Times Dinner & Tournament never fails to please. The dinner theatre near Exhibition Place is practically a stadium that seats up to 1400 guests and features live medieval-era performances such as falconry, horsemanship, sword-play and the world-famous jousting tournament. Dinner usually features a small feast that includes a roasted half chicken served with hot garlic bread, buttered corn and tomato bisque. 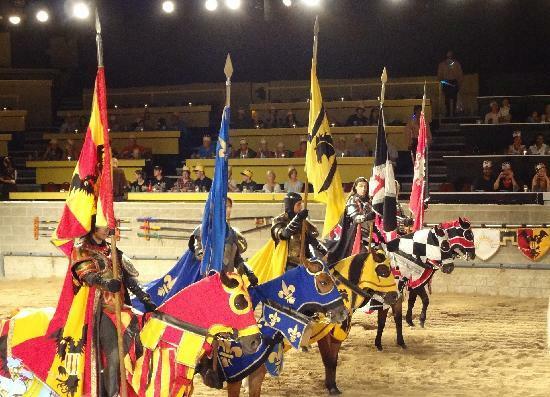 Diners are invited to eat and watch as trained actors fight in an all-out jousting and sword-fight tournament that is reminiscent of a Medieval-era tourney. Don’t expect a quiet night out this Valentine’s Day if you decide to come here, but be ready to be thoroughly entertained! If you enjoyed this article, please visit our friends at alltherooms.com! All the Rooms is an aggregated search engine that links users to vacation accommodations from sites such as Airbnb, Booking.com, Priceline and many more! If you’re planning a trip to Toronto any time soon, check out what the city has to offer here!